Something Shannon neglected to mention in her awesome retelling of our Hawaiian lava trek is that we almost didn’t go. And had we not gone, I’d have been to blame. 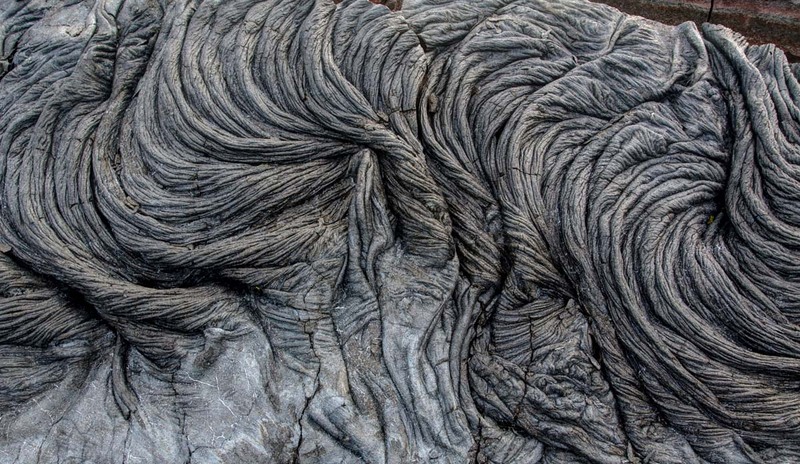 It’s not that I didn’t want to see neon lava rolling over land and exploding into the ocean. I absolutely did. We just had no guarantee we’d actually get to see anything like that. And in order to find out, we’d have to spend several hours hiking across what had become an all-too-familiar post-apocalyptic landscape. That may sound cool in its own right, but I came to that particular hike carrying a heavy burden of past experience. 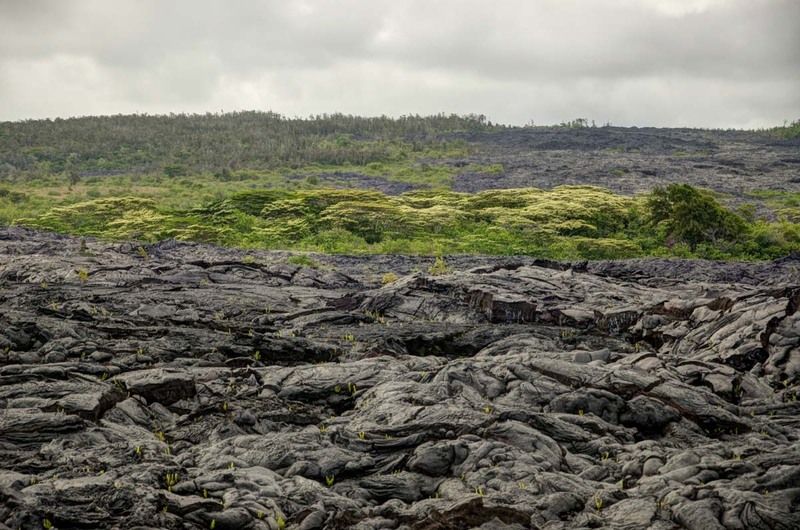 We had done so many similar hikes already, as recent as the day before in Volcanoes National Park, the previous week on Mauna Kea, several months earlier at Craters of the Moon National Park and other places in between. Seeing more rocks – black, barren and bereft – wasn’t exactly high on my to-do list. Fortunately, I lost the argument. And not just because Mother Nature put on a lava extravaganza more spectacular than we had any reason to hope for. But also because the recently-cooled volcanic rock we trekked through was more beautiful than any we had ever seen before. I had expected this one to be just like all the others; a tumultuous and torn terrain littered with rocky rubble as far as the eye could see. 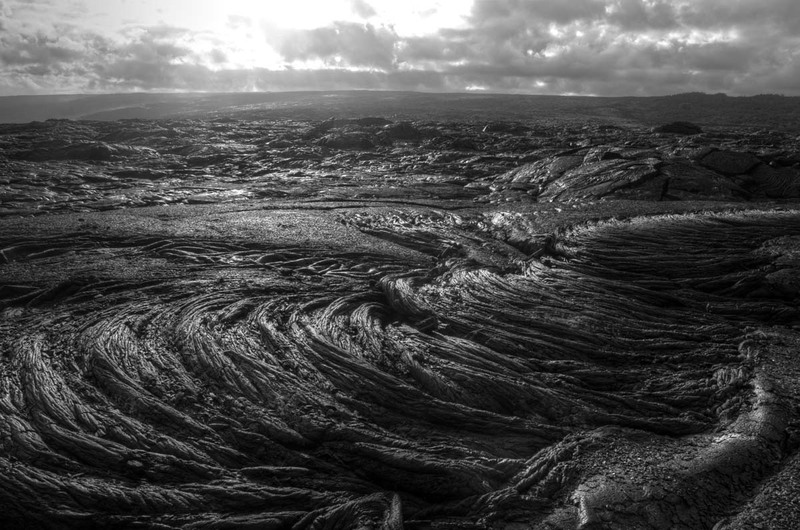 What we found instead was a landscape still bearing the supple appearance of molten rock. Gazing over the horizon toward a sky cloaked by gray clouds, we saw not a lava field but a monochromatic ocean frozen in place. And beneath our feet swirling eddies of once viscous magma only reinforced that illusion. What set this place apart from the other lava fields we had visited is youth. As a geological infant of just twenty three years, time has not had much opportunity to reduce its flowing surfaces to ruble. Eventually it will. What amazing pictures you captured of an amazing sight! Thank you for sharing. Great sculptures; and photo’s; thanks for sharing. Wow, those formations are amazing. Nature can really create beautiful art. Fantastic photos. I’m glad you lost that argument too! Really spectacular! When the result of giving in is this fascinating, it’s much easier to eat humble pie, I think. Nice. My only experience on the Big Island was doing some Marine Corps training there when I was stationed in Oahu. We drove by older lava fields, but I didn’t do any hiking there. The thing that impressed me the most was the depth of the dust where we camped – we used 8 foot metal posts to hold up the tents. Even driven all the way in they still wiggled in the very loose dust! Love your photos – very inspiring to make another visit to Hawaii.